“ This is happening right now! 10:30am: Arrests have been made as victims of Bank of America foreclosures attempt to enter the meeting. 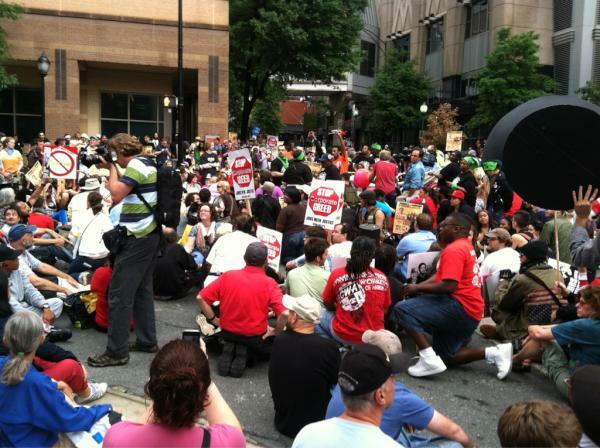 Follow on Twitter: @The99Power, @JWJnational, @domesticworkers, @codepink,@BankVsAmerica, #99power, #MakeBoAPay. 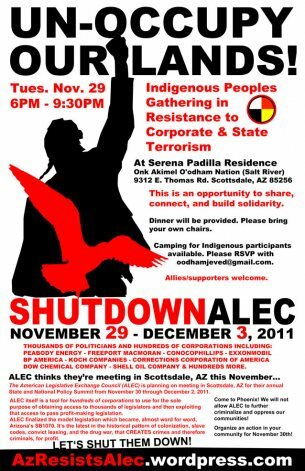 “OccupyPhoenix has moved to Scottsdale, Az for the next four days, and will join with Salt River Pima (Akimel O’odham) Tohono O’odham (formerly Papago, of the sublime basket-making) First Americans to protest against the American Legislative Exchange Council’s (ALEC) “States and Nation Policy Summit” in the Phoenix suburb of Scottsdale November 29 – December 3. So sad this is not getting more coverage! They own the media. Go to http://www.democracynow.org/ for the news.